Northwoods Home Rentals is excited to offer you this customer appreciation bundle incentive! Stay at Beach House during the week this winter for $125 per Night! 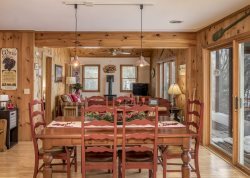 Come STAY & PLAY in the Northwoods and SAVE! Book NOW through the end of winter for additional discounted prices at every home! Take advantage of our lowest rates of the year, perfect for enjoying all the Northwoods has to offer. LIMITED TIME SPECIAL: Stay and Play at High Lake Hideaway! Book your summer vacation at High Lake Hideaway and SAVE $500 OFF your peak week stay! Book your vacation home and a pontoon boat to receive FREE delivery - $75 Value!